At age twenty-five, Michael Hastings arrived in Baghdad to cover the war in Iraq for Newsweek. He had at his disposal a little Hemingway romanticism and all the apparatus of a twenty-first-century reporter-cell phones, high-speed Internet access, digital video cameras, fixers, drivers, guards, and translators. In startling detail, he describes the chaos, the violence, the never-ending threats of bomb and mortar attacks, and the front lines that can be a half mile from the Green Zone-indeed, that can be anywhere. This is a new kind of war: private security companies follow their own rules, or lack thereof; soldiers in combat get instant messages from their girlfriends and families; and members of the Louisiana National Guard watch Katrina's decimation of their city on a TV in the barracks. Back in New York, Hastings had fallen in love with Andi Parhamovich, a young idealist who worked for Air America. A year into their courtship, Andi followed Michael to Iraq, taking a job with the National Democratic Institute. Their war-zone romance is another window into life in Baghdad. They call each other pet names; they make plans for the future; they fight, usually because each is fearful for the other's safety; and they try to figure out how to get together, when it means putting bodyguards and drivers in jeopardy. Then Andi goes on a dangerous mission for her new employer-a meeting at the Iraqi Islamic Party headquarters that ends in catastrophe. Searing, unflinching, and revelatory, I Lost My Love in Baghdad is both a raw, brave, brilliantly observed account of the war and a heartbreaking story of one life lost to it. About the Author: Michael Hastings, who spent two years reporting on Iraq, has worked for Newsweek since 2002. He has also filed stories from Israel, Gaza and the West Bank, Kurdistan, and Vietnam. He has been published in Slate, Salon, and Foreign Policy, as well as Newsweek International, for which he has written four cover stories. A portion of the author's proceeds from I Lost My Love in Baghdad will go to the Andi Foundation, information about which can be found at www.theandifoundation.org. Michael Hastings, who spent two years reporting on Iraq, has worked for Newsweek since 2002. He has also filed stories from Israel, Gaza and the West Bank, Kurdistan, and Vietnam. He has been published in Slate, Salon, and Foreign Policy, as well as Newsweek International, for which he has written four cover stories. 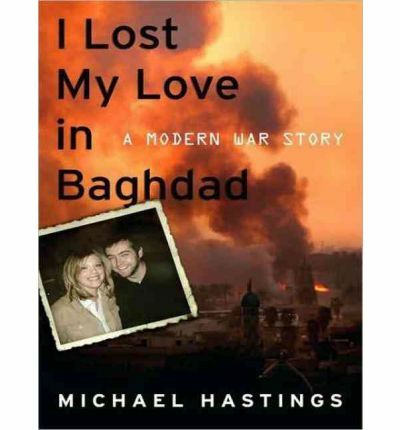 A portion of the author's proceeds from I Lost My Love in Baghdad will go to the Andi Foundation, information about which can be found at www.theandifoundation.org.